Technology used to study the "love" between entangled particles is also being used in research to improve deep-space communications. In 1964, physicist John Bell posited that such changes can occur instantaneously, even if the particles are very far apart. Bell's Theorem is regarded as an important idea in modern physics, but it seems to make little sense. After all, Albert Einstein had proven years before that information cannot travel faster than the speed of light. 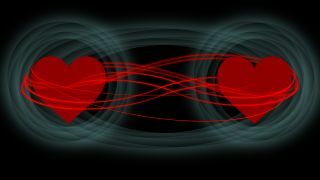 Indeed, Einstein famously described the entanglement phenomenon as "spooky action at a distance." This cartoon helps explain the idea of entangled particles. Alice and Bob represent photon detectors, which NASA's Jet Propulsion Laboratory and the National Institute of Standards and Technology developed. In the last half-century, many researchers have run experiments that aimed to test Bell's Theorem. But they have tended to come up short because it's tough to design and build equipment with the needed sensitivity and performance, NASA officials said. Last year, however, three different research groups were able to perform substantive tests of Bell's Theorem, and all of them found support for the basic idea. One of those studies was led by Krister Shalm, a physicist with the National Institute of Standards and Technology (NIST) in Boulder, Colorado. Shalm and his colleagues used special metal strips cooled to cryogenic temperatures, which makes them superconducting — they have no electrical resistance. A photon hits the metal and turns it back into a normal electrical conductor for a split second, and scientists can see that happen. This technique allowed the researchers to see how, if at all, their measurements of one photon affected the other photon in an entangled pair. The results, which were published in the journal Physical Review Letters, strongly backed Bell's Theorem. "Our paper and the other two published last year show that Bell was right: any model of the world that contains hidden variables must also allow for entangled particles to influence one another at a distance," co-author Francesco Marsili, of NASA's Jet Propulsion Laboratory (JPL) in Pasadena, California, said in a statement. There are practical applications to this work as well. The "superconducting nanowire single photon detectors" (SNSPDs) used in the Shalm group's experiment, which were built at NIST and JPL, could be used in cryptography and in deep-space communications, NASA officials said. NASA's Lunar Atmosphere Dust and Environment Explorer (LADEE) mission, which orbited the moon from October 2013 to April 2014, helped demonstrate some of this communications potential. LADEE's Lunar Laser Communication Demonstration used components on the spacecraft and a ground-based receiver similar to SNSPDs. The experiment showed that it might be possible to build sensitive laser communications arrays that would enable much more data to be up- and downloaded to faraway space probes, NASA officials said.